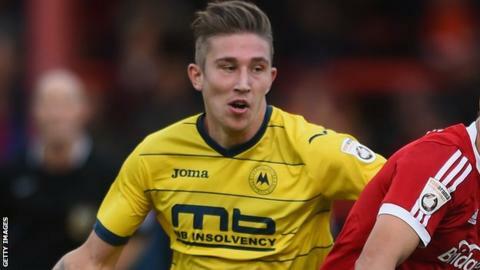 Torquay United will monitor central defender Angus MacDonald after he suffered a concussion in their 5-0 FA Trophy win at Bishop's Stortford. They are without the suspended Aaron Downes and injured Jake Hutchings, and youth-team player O'Neill Odofin got his debut when he replaced MacDonald. "We're just making sure he's safe," said manager Chris Hargreaves. "I thought it was a collarbone or dislocated shoulder, but we think it's concussion." Ryan Bowman scored twice for the Gulls, along with goals for Luke Young, Duane Ofori-Acheampong and Jordan Chapell, who got his first goal in almost 14 months in the final minute. "To score five goals is pleasing," Hargreaves told BBC Radio Devon. "I thought we punished Bishop's Stortford when we needed to. "It was a tough game because they threw a lot of bodies into the box, they moved the ball quickly and got it forward quickly and I'm just delighted because for a young group of players that's a good sign. "I thought we looked very dangerous, at times we really carved through."